A Compromised Generation reveals how seemingly benign elements of American culture are making millions of children chronically ill, disabled, or dysfunctional. Children are being diagnosed with illnesses such as autism, asthma, allergies, and ADHD at a breathtaking rate. The etiology of autism continues to confound mainstream medicine, yet parents, medical researchers, and healthcare practitioners dedicated to unraveling the mystery are beginning to put the pieces of the puzzle into place. They have found that environmental factors that cause autism are the same ones causing epidemics of ADHD, juvenile diabetes, asthma, gastrointestinal disorders, and many other chronic illnesses. Although the specific pathophysiology of each individual child's illness varies, they all have the same basic underlying causes. It is a perfect storm of environmental factors including decades of pharmaceutical over-usage, toxic or nutritionally anemic diets, excessive exposure to environmental toxins, specific American habits and lifestyles, and excessive or improperly administered vaccines. 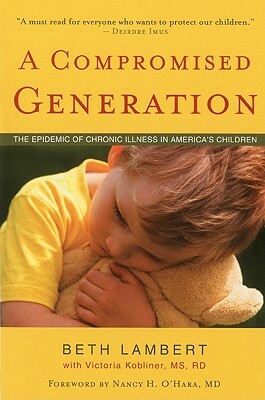 A Compromised Generation provides details on how this epidemic can be reversed and how to prevent more children from becoming ill, supplying evidence that children can recover from chronic illnesses, including autism, by altering their environmental influences and by stepping outside of the traditional western medical paradigm. Beth Lambert is a former healthcare consultant and teacher. She attended Oxford University and graduated with honors from Williams College. She holds an M.A. in American Studies, with a concentration in American Healthcare, from Fairfield University. Beth worked for a number of healthcare consulting firms in New York City including The Wilkerson Group, IBM Healthcare Consulting, and Easton Associates. She was also involved in market research and business development for an e-health company. She has worked with physicians, scientific and medical researchers, and corporate executives to assess products, business strategies, and emerging trends in pharmaceuticals, biotech, diagnostics, medical devices and healthcare delivery. She taught and coached at secondary schools in Massachusetts, New Jersey and New York City. As an educator, she worked closely with students who struggled with learning disabilities. She has traveled extensively throughout the United States, networking and collaborating with other educators through the National Endowment for the Humanities Landmarks of American History and Culture Program. Beth is the Executive Director of PEACE: Parents Ending America's Childhood Epidemic, a 501c3 non-profit organization dedicated to educating the public about the epidemic of chronic illness affecting our youth, and helping parents connect with other parents and appropriate healthcare providers. In 2009, she launched ANSWERS for an Epidemic (www.epidemicanswers.org), an educational website with a healthcare provider directory for parents looking for practitioners that specialize in recovering children from chronic illnesses. Beth is the mother of three, and is passionate about preventing chronic illnesses in children.